Very rarely do I walk away from a dining experience and think “I can’t WAIT to come back here.” But my bibimbap at Imonay House was just. that. good. 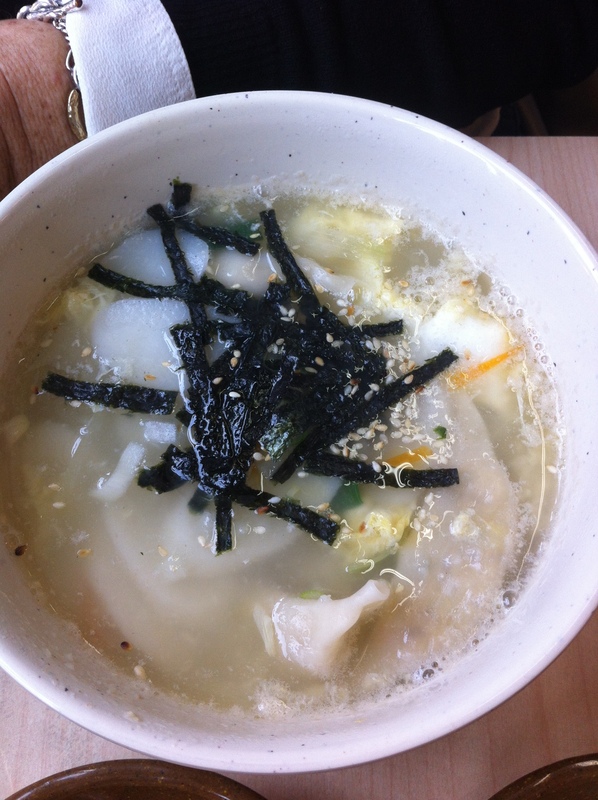 I am a deep lover of Korean food. To me it strikes a delicious balance between healthy freshness and indulgent comfort food. I love the rich, satisfying melt-in-your-mouth flavour of bulgogi (grilled, marinated beef). 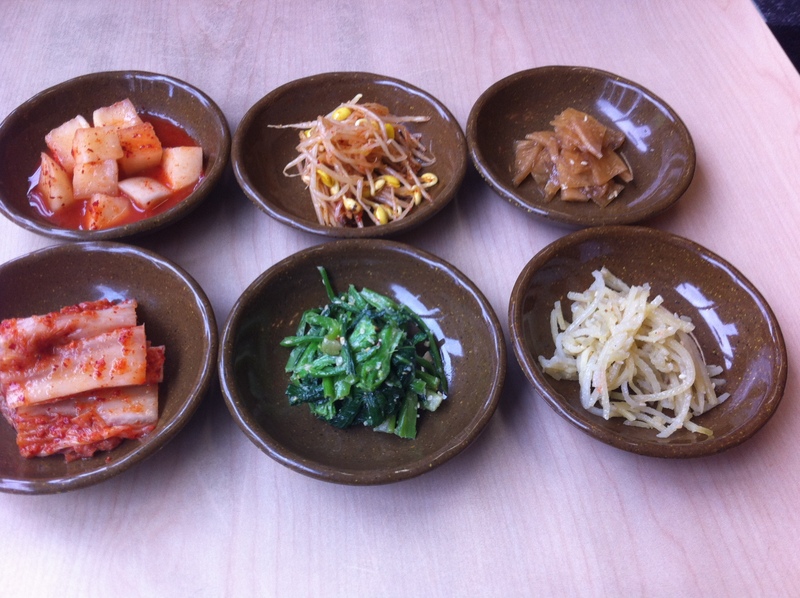 I love banchan (the side dishes you eat with your rice), especially kimchi (spicy fermented cabbage). And my life was forever changed when I discovered dolsot bibimbap, cooked rice topped with sauteed veggies, a fried egg, and gochujang (a spicy-sweet hot pepper sauce), served in a burning hot stone bowl. Imonay House delivered the goods on all three of my favourites (the banchan was cabbage and radish kimchi, fermented sprouts, garlicy potato threads, cold sauteed rapini and a yummy pickled radish), plus turning out some solid jap chae (sweet potato glass noodles and veggies in a sweet sauce) that was flavourful despite being a little on the greasy side. My dolsot bibimbap was served in a bowl so scalding hot that the bottom layer of purple rice fried up to the most amazing crispy texture. My dining companion tried the soup with rice cakes (sort of like big soft rice pasta rounds) and dumplings, which was good but nothing exciting to either of us. I tend to stay away from the soup at Korean restaurants– I know people supposedly love soon tofu soup or pork bone soup, but I have had no successes with these yet (I tried the seafood soon tofu at Buk Chang Dong Soon Tofu, which, incidentally, is reported to contain 4200 mg of sodium— it tasted like gritty, fishy grossness- and my dining buddy and I were so put out that we thought we might throw up halfway through our meal and had to brush our teeth 3+ times once we got home). ANYWAY. Imonay was a big time keeper. I will be happy to try a few other items on the menu but most importantly, I know where I’ll be going to get my bibimbap fix when I’m in the neighbourhood. Our server was also really friendly and helpful, and the interior, although nothing special, had a cozy feel. 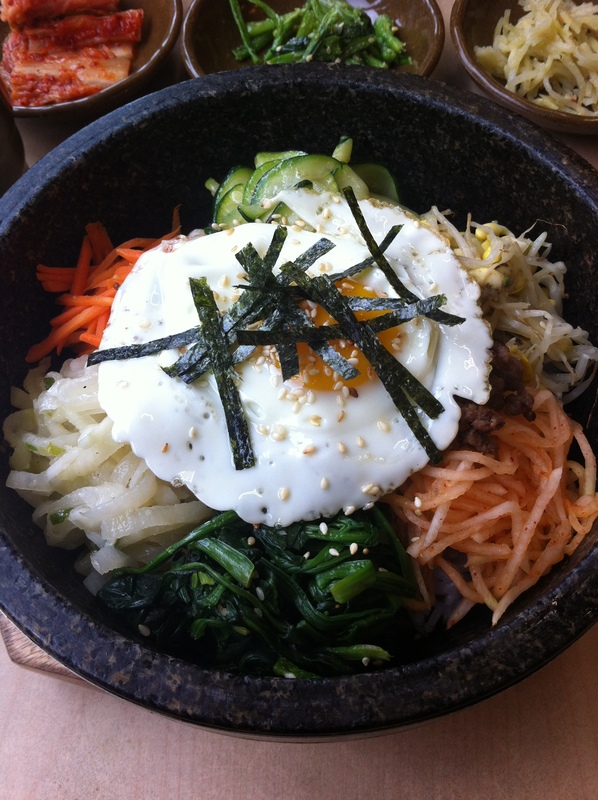 Sigh…I’m still daydreaming about the bibimbap. This entry was posted in Dine Under $50, Korean, Recommended, Uncategorized and tagged banchan, bibimbap, bulgogi, jap chae, kimchi. Bookmark the permalink.